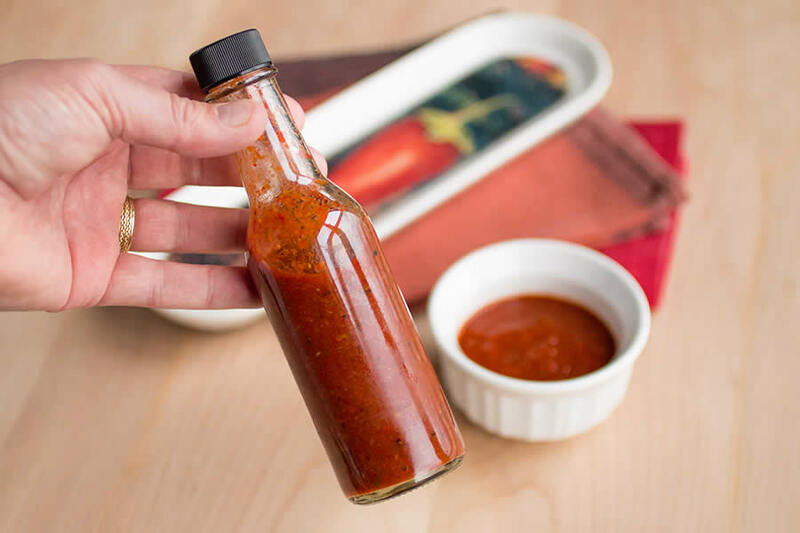 A homemade hot sauce recipe made with a variety of superhots, including the Carolina Reaper, 7-Pots and Scorpion peppers. Very hot! OK, my friends. It is time to reveal one of the hottest hot sauces I have ever made in my own kitchen. Yes, it is homemade and it is crazy hot. Crazy hot in a good sort of way, the way only a serious chilihead can enjoy. Or any true heat lover. The story is this. I was putting the finishing touches on my new cookbook, “1 Million Plus! Cooking with the World’s Hottest Chili Peppers” and I had acquired a couple of pounds of superhot chili peppers to complete a photo shoot for the cover and promotional materials. We took our photos and when everything was wrapped up, I had the wonderful benefit of having a LOT of superhots to work with. I also grew a slew of peppers in our own garden this year. We’re talking Carolina Reapers, Scorpions, a couple of 7-Pot Chili Pepper varieties. And that was what I had. A big variety. With superhots, you can expect a wide range of heat, though the majority of them start at over 1 Million SHU. Some will approach or surpass 2 Million SHU, which is somewhat insane, but again, these are ranges so you can typically expect your pepper heat to fall in the middle somewhere. The heat depends on many factors, such as soil and growing conditions of the particular peppers.Well, my leftover peppers must have been grown under some ideal conditions, because they were HOT. Yeah! Nice and hot! Top of the range. I didn’t not want them to go to waste, so I turned the majority of them into a hot sauce that I still have today. This is a Louisiana style hot sauce with a few extras added in for flavor. A Louisiana style hot sauce consists of peppers and vinegar, and they’re extremely popular. With good reason. This superhot version brings in the variety of superhots and adds in roasted garlic and basil. That’s it, with a bit of salt. You can expect variable results depending on the chili peppers you choose to work with. To push for the top end of the scale, use only Reapers or 7-Pot Brain Strains if you can get them. Pure Scorpions would be crazy killer hot. Or vary it up like I did. You can also make this with roasted jalapenos, or pretty much any pepper you prefer. Choose your peppers with love. That is always a good place to start. A word of caution. Aside from the obvious heat you will achieve with this sauce, you must also beware of fumes in the kitchen. Make this sauce in a well ventilated room. Open the windows if you can. Pepper fumes can be rough, especially with superhots. Consider a mask and/or goggle to protect your eyes. Also, wear gloves. I cook with superhots all the time and the oils usually do not bother my skin, but when cooking with a large amount, cutting them open, handling them, you will get some on your skin. It may burn, but if not, it can still burn other parts of your body that you touch. So, be careful. Learn How to Stop the Chili Pepper Burn. Once you’ve made the hot sauce, jar or bottle it and let it sit a week or two for the flavors to truly meld, though you can eat it right away if you’d like. Enjoy! There is an MC Hammer song playing in my head right now. “Can’t Touch This!” Seriously, I was afraid to get near it to even take a photo. Mike is crazy. What are the Hottest Peppers in the World? 1 pound superhot chili peppers stems removed – use a mix! Anything over 1 Millions Scovilles, baby! Heat an oven to 400 degrees. Set the superhot chili peppers and garlic on a baking sheet and bake them about 15-20 minutes, or until the skins slightly char. Keep an eye on these. You don't want them to burn, and watch out for any fumes. Add peppers to a food processor. Squeeze garlic out of their skins and into the food processor they go. Add basil leaves and process. While processing, add in vinegar until it is nicely pureed. Watch out for the fumes! Add salt and stir. Push the sauce through a strainer or use a food mill to really strain it. Pour into sterilized bottles and enjoy. Give to your friends! The longer you let it sit, the more the flavors will meld. This made a couple of bottles for me. This is a KILLER HOT HOT sauce. So good! I made this today with the last of this year’s Reapers, Scorpions (Maruga & Butch T), Ghosts, Habanero, and some Red Jalapenos. I grow them all from seed and had a bumper crop this year. I smoked the peppers using indirect heat on my charcoal Weber for about 30 minutes before adding them to the pot. I also added some lime juice and honey to the recipe. I didn’t strain the sauce so it’s a little thick but I like it that way. It tastes great today so I imagine it will taste even better in a couple of weeks. The smokiness really comes through with just a hint of sweet. 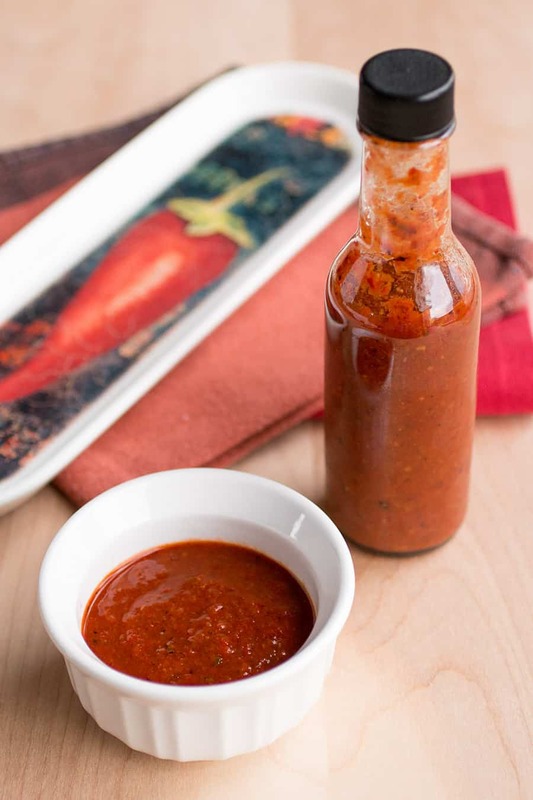 The heat is pretty intense and lasts for a while………great hot sauce recipe!! I can’t wait to try your other pepper head recipes. Thanks so much for this recipe – making it now (and staying true to your directions). I’m going to toy with it the next few times with other things like carrots/honey/sugar etc. Thanks! Great, Chuck! Thanks! Let me know how it turns out for you. Love this recipe! A friend gave me alot of ghost peppers and scorpion peppers. I used about 10 of each and used fresno peppers to get to a pound (because while I love spicy…I wanted to actually be able to eat the sauce). The flavor is absolutely incredible and it is still crazy spicy! I just made it today and have already been eating it. I can’t wait to see how the tastes after the flavors have time to meld. I couldn’t use the peppers right when I got them so I froze them and just defrosted them before I roasted them. It worked perfect! Thanks for the awesome recipe. I will definitely make it again using different pepper combinations. Thanks, Angela! I appreciate it! Glad you enjoyed the recipe! One quick question…after sitting overnight my sauce has separated. I’m sure it will be fine once I shake it up….but is the separation normal? I completely strained mine so it is purely liquid. You’ll notice more separation if you strain it, but yes, a quick shake takes care of that. So I took this recipe and your bhut jolokia hot sauce recipe and sort of combined them. Basically I roasted the ingredients of the other recipe instead of sauteing and added the basil and garlic of this recipe. The whole thing tasted like a super spicy tomato sauce. I like using it on anything Italian, southeast asian or real bland (like Mac and cheese) The red wine vinegar I think is overpowering for the other recipe, but goes great with the basil and garlic of this recipe. Ok, I could only get my hands on 6 Scorpion peppers. I roasted them along with Mango, Garlic, Carrots , and Serrano peppers on the grill for 10- 15 minutes. Then slowly boiled them in 16oz of white vinegar . I Put them in the Blender, then a good mill. The sauce seems kinda thick. Is there a way to thin it? Bierolson, you can thin the sauce with either water, stock, or more vinegar. Another way is to simmer the sauce with some beer for a while. Extra flavor that way. Let me know what you wind up doing! I only used a 1/4 lb of Reapers (all I had from my plant) and back filled the rest with Chilacas and it still came out wicked hot. Everyone who’s tried it is addicted. Even the girls at work were putting drops on the back of their hand and licking it off, then coming back by my desk for another drop every 20 minutes. Just made this using only Carolina reapers ended up with about 16 oz of the good stuff …. HOLY HELL THIS STUFF IS HOT … I love super hot food but I really dont even know what to use this stuff for. Anyone have any suggestions? Ken, yes, it’s about as hot as you can get. You can use a drop to heat up a whole pot of chili or a stew. Or, you can try to dilute it. Make a batch of sauce with nothing but sweet peppers (no heat) and mix them. Repeat until you’ve got a sauce you can enjoy. You might have a lot of sauce, though! Let me know what you wind up doing. Super curious. I’m not crazy about superhot stuff, but I’m trying to be. How weak would I make this sauce if I used 50g reaper, and 400g jalapeno or Serrano level peppers? Taylor, it wouldn’t be as hot with the jalapenos or serranos, but if you’r’e still using Reapers, you’ll get a LOT of heat for sure. Let me know how it turns out for you. Mike, I finished the sauce used a teaspoon of sugar in each batch. 2 lbs of Trinidad scorpion and Carolina reapers from my garden. OMG I have bought the hottest sauces I can find and after I tasted it I ate 3 pieces of bread and half a gallon of milk to try to cool it down but was insanely hot! Love it! Flavor is good heat is ridiculous I may try to add maybe some fruit juice (pineapple or cherry) next time to see how it is. Thank you for the recipe going to have some friends try it out! Lol I got four mason jars half filled out of two lbs of peppers that I started growing in June. Let you know after next round how it turns out with some tweaking. Mike, firing up the grill ( roasting outside) to make some sauce I grow my own peppers (Reapers & Trinidad scorpion) I’m going to mix them. I have fresh basil, fresh garlic, red wine vinegar and I was wondering about adding sugar how much should I add? Was going to do honey as I saw you recommended in an earlier post but I ran out. Also anything else you think would be a nice addition? Hey, John. I would only add a bit of sugar. Brown sugar would be interesting to try. With this recipe, I like to keep it more pure peppers, but you can easily use it as a base to play. Carrots would be a nice sweet element. The superhots REALLY take over, though. Let me know what you wind up doing! John, I would just include a tablespoon of sugar or honey at the most, and there are a number of ingredients you can include to play with flavors you prefer. I sometimes strain to smooth it out, but not always. I hope you enjoy it! I was actually doing pretty good until I started washing the bowls and stuff. It was like I set off a CS grenade in the sink. An hour later, I think I’m finally done coughing and sneezing. Wow. Yeah, it’s a hot one for sure, Mikey! Just made this sauce with 1/2 lb of Bhut Jalokians and it is just what I was looking for! Tasty, lots of flavor and hot as hell! One thing: After I had scraped all the sauce I could get off the blending container and put all the implements in the sink to wash the fumes that came off when the water hit it damn near choked me! Really hadn’t expected that so just a word to the wise. Thanks, Phil. I’m glad you like it. Yes, often times there are the fumes that can get you. Best to work in a well ventilated room. Thanks for the reminder! I rinse all of the utensils and dishes in cold water first, not nearly as bad. Do you store this in the fridge or pantry immediately after bottling? Sue, I store mine in the fridge. I feel it is safer that way, despite the acidity. Some people keep their hot sauces in their pantry. I I do not have a scale. Approximately how many peppers is a pound? Darlene, the sizes vary with peppers, so weighing is best, but with most superhots, you’ll use anywhere from 30-60 or even more if they’re fairly small. Going to try this recipe out today with some peppers out of the garden. Going to be using Trinidad Moruga Scorpion, Devil’s Tongue, Reaper and Ghosts. I prefer grilling my peppers whole. My question is being that I am going to be using a couple of beastly peppers I have considered adding sugar to the recipe to give it a sweet kick. Any recommendations on whether I should brown or white sugar? As for vinegar which would help the flavor profile more. – I have white, champagne and apple cider that I can use. U look forward to hearing your thoughts. Great, Tony. Let me know how it turns out for you. If you’re going to use sugar, I would use white sugar for this one over brown, or instead try honey. For the vinegar, I would use champagne vinegar, though either would work with this recipe. Looking forward to hearing how you like it. Hi Mike. Made the hot sauce and used light brown sugar and white vinegar since I couldn’t get the page here to load and see your recommendation. It definitely has a good flavor profile with the sweet blending nicely with the heat. I have had a more than a few compliments on it from true heat lovers (and even lit up a few who thought they knew hot LMAO). Will definitely try your recommendation next batch. Thanks, Tony! I’m super happy you enjoyed it. It’s definitely one of my favorites. Have a good one! Thanks, Angela! You can easily rehydrate dried pods to make hot sauce. Here is a link to help you – How to Rehydrate Dried Chili Peppers. Awesome, John! Truly, you can make any hot sauce with this technique, as you’ve proved! Thanks for shouting out. Wish I could taste your hot sauce! Has anyone ever tried smoking these chillies like a Chipotle because I love the smokiness of Chipotle sauces but they are not as hot usually being made of jalepeno.. also what kind of protection do you use when making these insane hot sauces? I’m kinda scared to cook up any of these concoctions in my home..
10 Tips for Cooking With Superhot Chili Peppers. How to Smoke Chili Peppers. What would the shelf life be. Thanks, Ma. This will easily last a year in the refrigerator. If you’re concerned, check to ph to get it below 4.0, preferably 3.5, by adjusting the amount of vinegar. Enjoy! I have 64 plants almost tall enough to be transferred outdoors. T scorpions, bhut, Carolina Reapers, chocolate scotch, habanero, and ghost this year. Should be a good season for peppers in Mississippi. I would say a GREAT season! Good luck! Im making an insanity sauce, do you think this recipe will make a good hot sauce? REPLY: Gage, sounds good to me! — Mike from Chili Pepper Madness. 170g trinidad scorpion, 110g scotch bonnets, 60g 7 pod(brain strain) ,40g carolina reaper, 60g cayenne, 60g birds eyes, + garlic salt ,vinegar , basil as per recipe.. = 15-15.5 /10 ,super hot but tasty almost borderline uneatable(undiluted), ticks the 3 boxes( numb lips ,throat burn + head sweat!!) . Round 2:(under construction) I try for 500g of scorpions, 300g reapers , 400g 7 pods:) we’ll see!!! REPLY: Awesome! Keep me posted! — Mike from Chili Pepper Madness. REPLY: Nice! Yes, quite hot!!! — Mike from Chili Pepper Madness. A friend gave me a jar of 5 pickled Reapers which I want to try on this recipe. I can fill out the weight with some dried Habaneros from my garden. My question is, do I need to make any adjustments because the reapers are pickled? REPLY: John, you can rehydrate the habaneros to fill out the recipe, yes. I’m not sure if you’ll get a flavor change starting with pickled reapers, but the recipe will work. I think it will be good. Let me know how it turns out. — Mike from Chili Pepper Madness. I have always wanted to commercially sell hot sauce do you have any advice for me? REPLY: Gage, I plan on writing either a book or a large blog post about this subject, but the main thing is making sure you have a great recipe, a good production facility that follows all FDA safety rules, good bottling and distribution, and a sales plan. Generic, I know, but contact some of the big names out there and see what they’ve done to get going. — Mike from Chili Pepper Madness. does a sauce prepared this way need to be refrigerated? REPLY: Colin, it really depends on the final acidity, which should be below 4.0, though I prefer to refrigerate my hot sauces regardless. — Mike from Chili Pepper Madness. Just picked 6gal of reapers and 5gal of habanio I plan to put them in my smoker for a few hours. Last year I did ghost peppers I removed all the seeds . Do you remove the seeds or not ? I have basil so I will pick some to try. REPLY: Johnny, I usually don’t remove the seeds, but you can if you’d like. — Mike from Chili Pepper Madness. Do you think cooking/charring the peppers on the grill would be a good idea? Or perhaps even boiling the peppers. REPLY: Ben, absolutely. I do this all the time and love charred peppers. You can easily peel them this way if you’d like. You can also boil them and process them, or process them simmer. Many methods. — Mike from Chili Pepper Madness. Lovin’ it! I used reapers and t-scorpions, no straining. Reapers have a nice taste. I tried it with ghost peppers, but did not like it as much. I followed the recipe exactly and it turned out fabulous! I used a pound of super hots that I purchased off of craigslist. They were a mix of Naga Viper, 7 Pot Douglah, Carolina Reaper, and Trinidad Scorpians. I also used dark purple basil. The recipe made approximately 20 ounces of finished sauce (I didn’t strain it). The flavor is fantastic! I opened all my windows and had a box fan going while I made it, but the worst fumes happened while washing the dishes 🙂 Thank you for this awesome recipe! How much sauce do you end up with from this recipe, and how well does it scale down? Also, do you know off-hand about how many peppers are in a pound? I’m probably only going to be able to spare about a dozen from my harvest. REPLY: Dan, you can still make this sauce and yes, it does scale. Depending on the size of your pods, you can get about 20-30 pods or more per pound, as they are quite small and light. You’ll still get quite a lot of heat with a dozen or so. Try adding other peppers to round it out, or tomatoes. Let me know how it turns out for you. — Mike from Chili Pepper Madness. I have only 2 reaper peppers, and was wondering how I could make them into a hotsauce using your recipe, any tips on how to slim the recipe down for it? REPLY: Kaito, you could try adding in other peppers to fill out the recipe. Thereapers will still add PLENTY of heat. Otherwise, you really won’t make much sauce with only 2 reapers. — Mike from Chili Pepper Madness. REPLY: Michael, I often use a typical 5% white vinegar, though this also works with better quality vinegars, like white wine vinegar or champagne vinegar. It is to your taste preference. Let me know how it turns out for you. — Mike from Chili Pepper Madness. I have made a sauce like this, but instead of the oven i use the grill with a little apple wood. I do mine a little differently and you might want try this as it will add to the flavor profile. Ferment the peppers. To do this, add the stemmed peppers and salt to the food processor with a tablespoon of white sugar. Pulse until the peppers are finely minced. Transfer to a quart mason jar and cover with a coffee filter. Let sit for 7 days. On day 3 start to stir the mash twice a day. On day 8 transfer mash to a blender and add your other ingredients and puree. Then force the mixture though your strainer, pressing with a spatula, to remove skins and seeds. You can bottle at this point but I like to bring the mixture to a hard simmer for a few minutes. Had not thought of using basil before but will try. If you dehydrate the peppers and make a flake/powder, how much would you use to make this sauce? REPLY: The ratio by weight is typically 10 raw to 1 dry, so you should factor accordingly, though it may take a bit of experimentation. I make hot sauce from dried pods frequently and it always works out great. One habanero sauce I do calls for about 30 dried pods. Love it. — Mike from Chili Pepper Madness. REPLY: Horacio, that’s awesome! — Mike from Chili Pepper Madness. I’m conditioned so that my head starts to sweat just reading recipes like this. I’m growing Reapers this year and I also have a nice crop of habaneros coming in. I’ve seen many recipes that ferment the sauce for about a week before bottling. What does that do for it? Also: do you include the seeds and membranes? REPLY: Mitch, fermenting the pods mellows them out and does add a lot of flavor. I am currently fermenting a load of peppers and will be writing about this soon. I DO include the membranes and seeds, though you can remove them before fermenting and saucing. With superhots, though, removing the membranes won’t really reduce the heat as the heat is spread throughout the pod, unlike milder peppers. — Mike from Chili Pepper Madness. I have one rookie question- why the basil? I’ve never seen herbs of any kind in hot sauce ingredients lists before- commercial or otherwise. Salsa, yes, but not hot sauce. What does this do for it? REPLY: Barry, I LOVE fresh basil in sauces. Adds a nice dimension. You can try cilantro, which would be nice as well. — Mike from Chili Pepper Madness. I am assuming using dried reaper peppers is OK for the recipe? REPLY: Daniel, yes, you can use rehydrated dried peppers. No problem! Let me know how it turns out. — Mike from Chili Pepper Madness. Hi, I have just made this recipe today, thanks, so easy to do. I do not grow any super hots so just used several orange habanero and made up the rest with a mix of other milder chillies I grew last season – still very tasty and very hot. Texan stuck in Ga. Other than ONE Mexican restaurant, the ideas of spicy in ga I call tap water. I am real happy to have found your page. I heard of a chili a long time ago that is so hot it could cook an egg when the chili is still cold. Any ideas what types of spices they used for that? Also what is the best garden or Greenhouse setup for getting the most flavor and keeping the heat? REPLY: Ronald, thanks, and glad you found the site. You can refer to our growing section on growing info, though I have not personally setup a greenhouse. Sorry. I haven’t heard of an egg being cooked in a cold chili. Not sure on that one! But I’d love to see that! — Mike from Chili Pepper Madness. Do you have a resource for dried peppers? I can’t find any of the ones mentioned in my area, fresh or dried. REPLY: Jon, check out some of our Resources pages for links you can try: https://www.chilipeppermadness.com/resources/chili-seeds – Mike from Chili Pepper Madness. Looks wonderful. I fortunately live close to Smokin Ed Currie’s shop in South Caroilna and was able to pick up a packet of Carolina Reaper seeds among a few other varieties. Just now getting a few seedlings, and I’ll have then growing in a table-top greenhouse over the winter until I get them outdoors. Can’t wait to try the recipe. Do you know where to get the small bottles to store the sauce? Amazon? REPLY: Sounds great, Kris. Yes, I get bottles from Amazon. 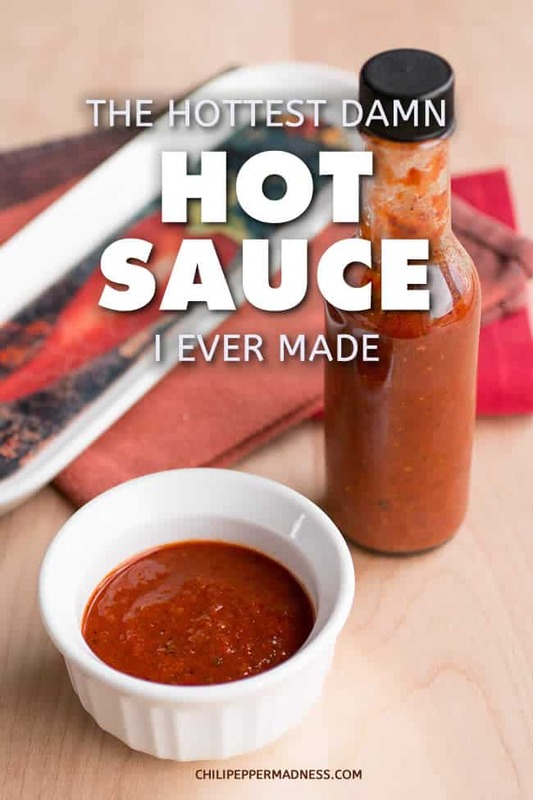 I have some linksin some of the hot sauce pages where you can find them. Thanks! — Mike from Chili Pepper Madness. I made two batches with these recipe–one with ghost pepper, one with Trinidad Scorpion. Both turned out great, but I did add extra vinegar to thin it out. I used my NutriBullet to purée it so I didn’t need to use a strainer. Thanks for the recipe! Made this sauce this weekend. Absolutely fantastic. With great power comes great taste. I used my home-grown Trinidad Moruga Scorpion peppers and made the hottest sauce i ever tasted which doesn’t have added capsaicin extract. REPLY: Awesome, glad you likedit! — Mike from Chili Pepper Madness. REPLY: Kevin, it might be better to sub in other peppers with the others you have to fill it out. You can easily cut this recipe in half, though, or even a quarter, for a smaller batch. Let me know how it turns out. — Mike from Chili Pepper Madness. I just made this tonight and it is definitely a WOW! I only had 12oz of scorpions so I used some thai peppers and 3 jalepenos to make up the other 4oz. I didn’t strain it as I used my blender to mix and added some extra vinegar to thin the sauce. It came out very smooth and is thick but not chunky at all. I can’t wait til more peppers are ready. REPLY: Sounds awesome! — Mike from Chili Pepper Madness. Do you leave the seeds in before you put the peppers in the processor or take them out? REPLY: Ryan, I leave them in, but you can seed them if you’d like. Be sure to wear gloves. — Mike from Chili Pepper Madness. If I’m using rehydrated peppers (carolina reapers, in my case), do you still want to bake them or do you go straight to processing after rehydrating? REPLY: Matt, if you’ll be using rehydrated peppers, I would not roast them. You can always cook the sauce down a bit in a pot after mixing instead to mellow the flavors and let them meld. — Mike from Chili Pepper Madness. Hi. Are you using dried basil leaves in the recipe? REPLY: Thomas, I used fresh basil, but you can sub in dried basil. — Mike from Chili Pepper Madness. What if I’m using dried chillies? REPLY: You can use dried chiles. Just rehydrate them before using. Works great, actually. — Mike from Chili Pepper Madness. I hope you see this. I am making this in July for Christmas gifts. Can I store it in cupboard or can I do a hot water bath to last till then? REPLY: Susan, you would need to do a hot water bath to preserve this for long term. Once opened it should be stored in the fridge, though the vinegar should keep it OK. — Mike from Chili Pepper Madness. Just picked a pound or so of my super hots and wanted a good recipe for some hot sauce. I already have a batch “aging” now similar to this but made with my homemade star fruit and apple cider vinegar & lime juice. Have to give this recipe a try too! Thanks for the great recipe. I didn’t have a pound of chillies so I made some minor changes but the smell of the oven roast garlic and chilli was awesome! Now have a bottle of that really packs a punch. The consistancy of the sauce looks fantastic. I have a load of red bhut jolokias ready for picking this week so I’m going to give this recipe a go. Will let you know how it goes. I intend making this sauce for Xmas but will be away on holiday. Can I leave it in the cupboard and how long will it last if not refrigerated? REPLY: This is a typical Louisiana style sauce with vinegar, and a number of resource say a sauce like this can last up to 3 years when stored properly, but I personally wouldn’t keep it that long. It will last longer in the fridge. The flavors change, though, as they age. Mike from Chili Pepper Madness. Can’t you just blend it until lreally chopped fine enough ? REPLY: Lois, yes, you can do it that was as well. I like to strain it, though, for a smoother sauce, but I don’t always. – Mike from Chili Pepper Madness.